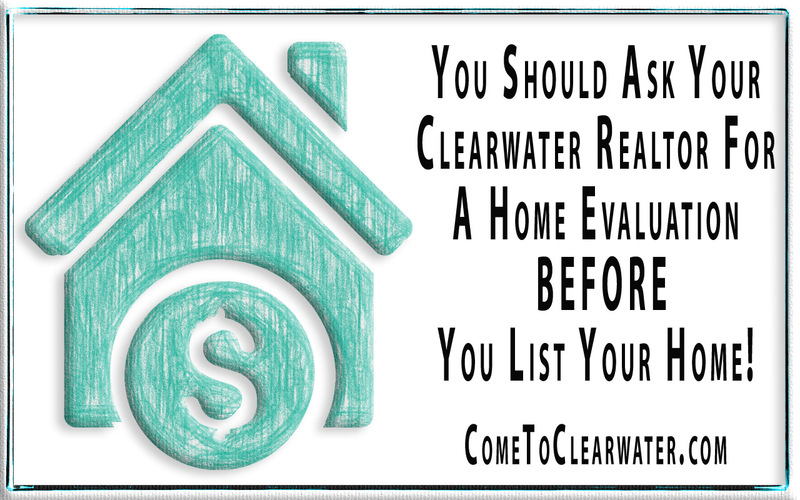 You Should Ask Your Clearwater Realtor For A Home Evaluation BEFORE You List Your Home! Selling your home for exactly what YOU want is a snap, right? After all, you looked up what your neighbors were asking for their homes. You know what you paid for it and what the value REALLY is… or do you? 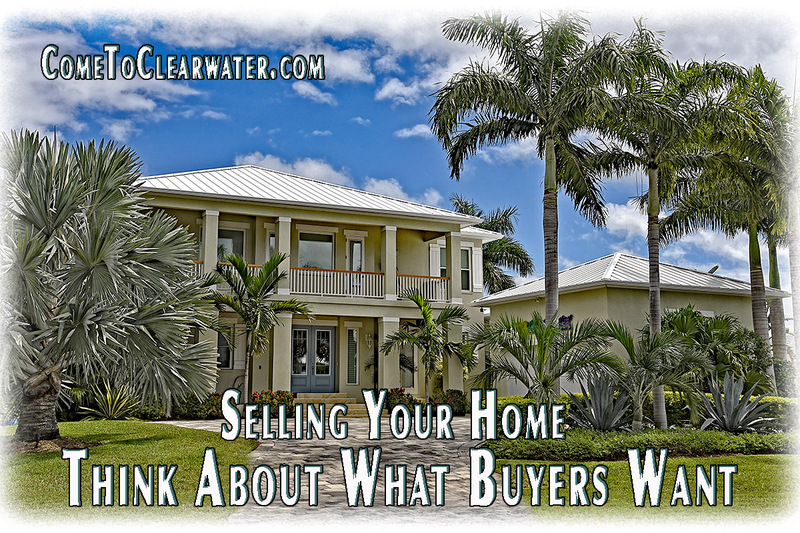 Before you go listing your Clearwater home, you better get a Realtor to evaluate it. So why is your number most likely too high? So many reasons! First, your emotional connection to your home will make you almost automatically value it too high. Your emotional attachment has no bearing on price. It can’t be quantified and added into the actual value. Don’t fool yourself into thinking you can be objective. You have either good feelings about your home or bad, you don’t have objective ones. As for what your neighbors listed their homes for, it has no bearing on the value of your home. Seems like it should, but there are too many other factors involved. Let’s list a few of them. Your homes may seem like they are the same size, but square footage of living space can be very different. Is their attic finished? Is yours? Is their garage a garage, or a finished rec room? Have they updated their home? Have you? What amenities do they have? Do they have a pool or spa? Granite counters? New appliances? All of these differences change the value of their home and yours. The amount you paid for your home also has no bearing on its current value. It certainly will help you figure out your equity, but the value then isn’t the value now. It could be lower or higher, depending on updates and how your area has bounced back from the real estate troubles of the last decade or so. So how do you find out the actual value? Call a Realtor. They know how to value your home and get you the best price possible. 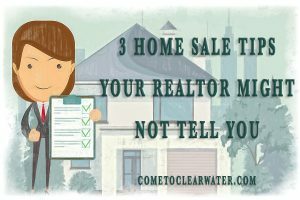 It may sound like a silly thing to say, but when you are selling your home you should think about what your buyer wants. That could mean a lot of things, but if you think about how your home looks from the eye of a buyer, you’ll probably do more to sell it. So what do buyers want in a home? Of course they are looking for things like school districts or the amenities a neighborhood can offer, but those things aren’t really in your control. You may have bought your home not thinking about kids and schools, or about whether shopping, restaurants or entertainment is close or farther away from your home. The school system may suddenly have got better or worse, or something could have been built close by, but again, it’s beyond your control. What you can change is your home and yard. Start outside and look at your home from the perspective of someone buying. Is it inviting or overgrown? Is it tidy or strewn with toys or trash? Take some time to work on your landscaping. Paint or clean your front porch and/or door, back deck or patio, sidewalks and driveway. First impressions count. 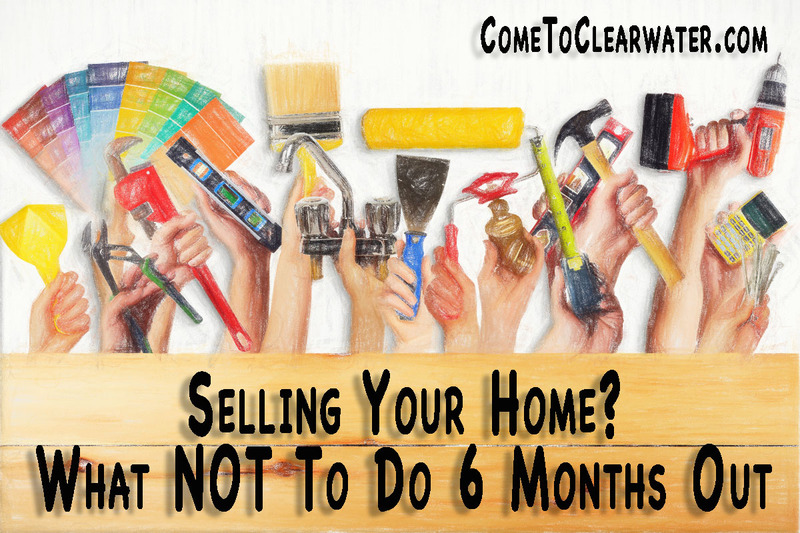 Don’t turn buyers off before they even step foot in your home. Now that all of that is finished, time to fix your inside. Declutter, clean and touch up or completely paint. Bring your Realtor in to get his or her input on what furniture should go and what should stay. Remove all extra furniture and stage all rooms to make them look inviting, spacious and new. Update where your Realtor says you should, budget allowing. Then keep up the staging and cleanliness. Make what you can control the best you can and you will attract the right buyer for your home. 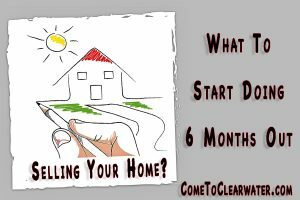 Last week we talked about what you should be doing six months out from listing or selling your home. So now let’s look at the reverse…what NOT to do. You know that list that your Realtor gave you about what needs to be fixed and what doesn’t? Don’t go above and beyond. What does that mean? Well, fix and update where they say needs it. Your Realtor understands the return on investment of updates and upgrades to your home. What they don’t want you to do is to start ripping and tearing everything out like you’re on Property Brothers on HGTV! Most renovations won’t give you much bang for your buck. This is especially true if you are doing renovations to your specific taste. Sure, baths and kitchens usually do give you a decent ROI, but that pink tile and $800+ bidet you’ve been dying to get for your bathroom that you just KNOW buyers will LOVE will most likely kill off any money you should have seen from the renovation. Another don’t: unless you are truly a professional in the home renovation field, don’t do any renovations yourself. Sure it looks easy on HGTV or DIY Network. It’s not and you could very quickly find yourself in way over your head. Leaving projects unfinished is much worse for your home’s value than not updating in the first place. Not to mention that what you destroy you’re going to have to pay a lot more to fix than if you paid a professional in the first place. Think plumbing fix that ended up in a flood ruining carpeting and hardwoods. Now you have to fix the plumbing AND the flooring. But even if you don’t have any disasters, the long reaching consequences will have a future buyer shelling out more later to fix your fixes. Actually, the only DO that I’ll say here that you should do is STOP WATCHING fix-it networks. Your future buyer will thank you! You have decided that you are selling your home. Not right away, but several months from now. If you think you don’t have to do anything now, think again! There are quite a few things you should do now to ensure you get the most for your home. So what should you be doing? Read on to find out. 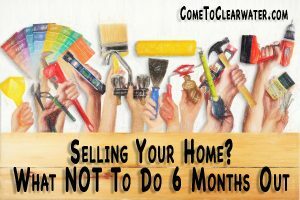 It’s not too soon and a Realtor will walk through your home and give you a good overview of what you will need to do to get your home in the best shape possible to sell. 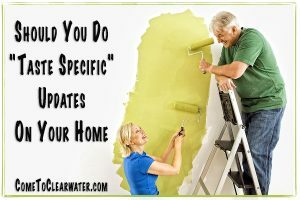 A Realtor knows what homes in the area have and are expected to have and will be able to tell you whether you need to update yours or if it’s good to go. It would also be a good time to get a home inspection to be sure all of the systems in your home as well as the foundation are sound or need fixing. Start on any repairs right away. Both finding a Realtor and the home inspection will provide you with a list of items that need to be done to get your best price, and the time to get them done. Do some legwork on your own and find out the high and low prices for homes in your neighborhood. That way you know what price you are aiming for when you finally list your home. You can keep a touch of your personal items here and there, but remove as much as you can and store it. You’ll be surprised at how much you don’t need to live day to day and how much bigger your rooms will look when you are done decluttering your home. It may also uncover other places that need fixing, paint that needs touching up or small holes that need patching. Here’s a great tip, rent a POD and start packing up your stuff. You’re going to have to move it anyway, so why not start now. That way there are no boxes cluttering up your storage areas. Buyers look at storage in the home, so the bigger it looks, the better. 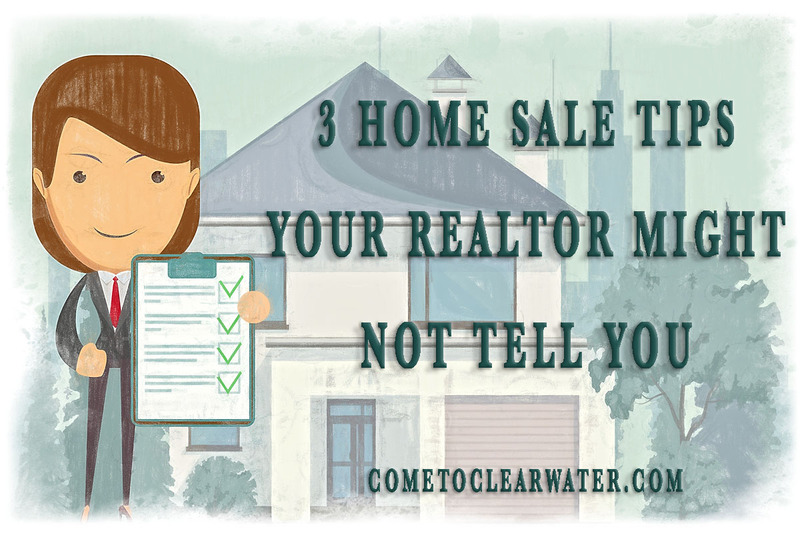 If you’ve had a discussion with a Realtor about selling your home, there are three things that he or she didn’t tell you. They probably didn’t tell you right up front because they didn’t want you to list with someone else. The problem is, these three things are important. You SHOULD expect your Realtor to tell them to you no matter what. First, you made it very clear to the Realtor that you MUST get, you NEED to get a specific price for your home. Guess what? It doesn’t matter what you must get or need to get for your home. Your Realtor doesn’t set the price of your home, the market does. You can list it for whatever you want, but unless you list it for a price that the market will support, it won’t sell. Any Realtor who doesn’t realize that fact isn’t much of a Realtor. Any Realtor worth their salt will tell you this first fact up front. Second, you know all those things that need to be fixed or updated that you’ve been putting off? Thinking that you can just pawn them off on the new owners isn’t smart, and it isn’t like the Realtor missed them when you walked through together. He or she was making a list. That list should have been shared with you right away. Why? Because you DO have to fix them all. 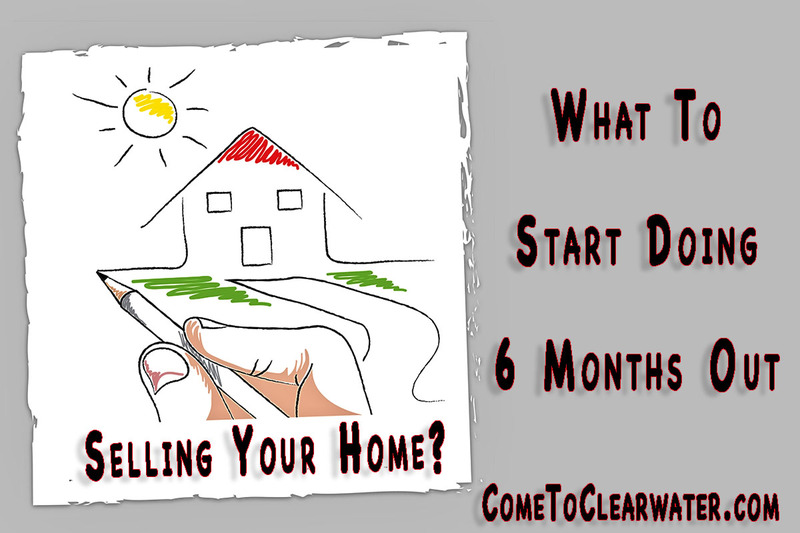 If not, you have to start with a lower asking price. It’s one or the other. Knowing now instead of waiting until later would be better for you so that you have time to get them done. Third, you realize that when people want to come see your home when listed on their schedule not yours, right? Oh, and you’ll have to be elsewhere when that happens. You were told that, right? No? Well they should have. You don’t get to set the showing schedule and you also need to not be there when people come. How can they feel comfortable looking through your home, cabinets, closets, etc., with you there? They can’t and that feeling of discomfort will transfer to their feelings about your home. End result – no sale. So, if you weren’t told these facts, now you have been! 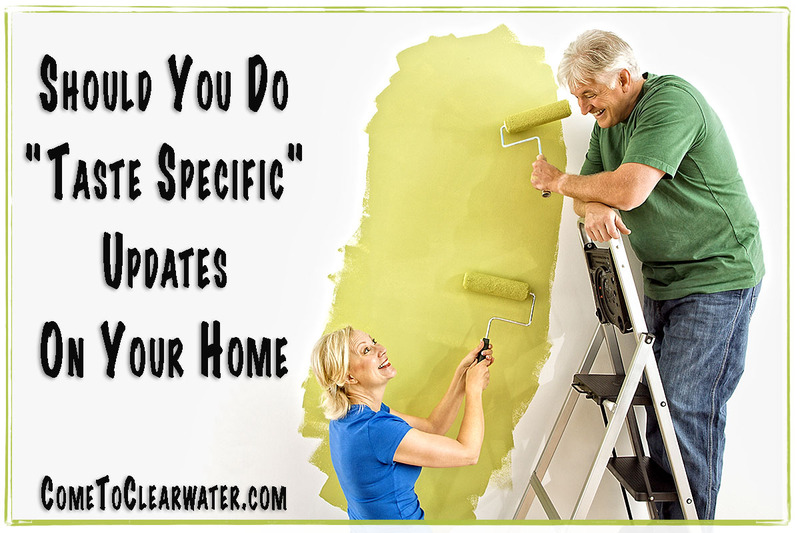 You’re bored with how your home looks, or you know you want to make updates to it. So do you do “taste specific” or go with the current trends? Yes. No. There are ways to make your space your own without making it impossible to sell later. These are things like painting the walls, changing the carpet, updating blinds or curtains, etc. All of these can easily be changed to more traditional or neutral colors later. Let’s say you want to paint your living room a color palette from your favorite sports team, and put a mural of the team on one wall. Yeah, that’s going to be a problem later when you sell, until you cover it with a neutral color later. For now it’s how you want it, later not so much, but how a possible home buyer may want it. Doing things like changing the type of flooring can be more permanent, but can also help you be able to personalize now and sell later. Taking out old, dated carpeting is a good thing. Replacing it with hardwoods is even better. You can use throw rugs to personalize, add splashes of bold color, but replace them later with more neutral ones. Be careful about the type of flooring you choose, though. Cheap vinyl that looks like wood is obviously a bad choice. These are things like tile floors and walls, countertops. Choosing to make these changes aren’t a no-no. Just be more conservative in your choices of these items. If you want to go granite, go granite, but something more neutral and less stand out. You can always use furniture, throw rugs, towels, curtains and artwork to make a space specifically to your taste. That way making it more easily less you later is simply accomplished.